Working in the field with Operation IceBridge, we think that every day we fly is exciting. We’re soaring above the stupendous Greenland Ice Sheet, spectacular outlet glaciers, or ever-changing, always mesmerizing polar sea ice, after all. These are not the kinds of settings most people get to call their “office” every day. On top of that we’re making important contributions to knowledge about a part of our world which is important to the future of all mankind, with every mile we fly. It’s good stuff, a dream job for many of us. But there is no denying that even the unique can become routine after a while. We are now more than three weeks into our deployment in Greenland. As I write this we are conducting our 11th flight of the campaign, part of a four-mission effort to survey the lower Northeast Greenland Ice Stream in unprecedented detail. And things are going smoothly and well. They are going so well, in fact, that many of the scientists and engineers are battling drowsiness as they monitor their instruments, and those who are off-duty are often napping. 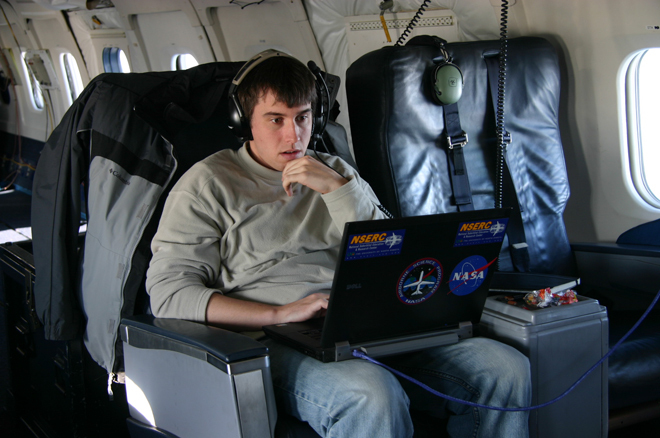 University of Kansas snow radar engineer Ben “Blitzkrieg” Panzer monitors his instrument (well, we think). He’s not nearly as intimidating as he looks. Note the first-class airline-style seats, too. Every experimenter has one, and they’re comfy. Image is courtesy of John Sonntag. We sometimes fly visitors on these flights, and occasionally they’ll express surprise to see so little apparently going on. There’s no chatter on the intercom system and not much movement aft of the flight deck (where I can assure you our flight crew is wide awake and probably chatting merrily). But some of us on board have years of experience with research flying, many hundreds of flights in my case, and we know and appreciate days like this. The lack of apparent activity indicates that nothing is going wrong! On board these flights, if you see a flurry of activity, people rushing around, or the like, it usually means something bad happened. It might be engineers rushing to replace a failed hard disk where science instrument data was being funneled. It could be that weather over the science target was poorer than expected, and we are scrambling to put together an alternate plan to deal with the situation. Or perhaps somebody’s lunch just boiled over in the microwave and made a mess. But when things go smoothly, the appearance is one of calm, quiet, even boredom. The boredom is often real, believe me, especially 11 long flights into a campaign. But the instruments are still working and recording their data, the airplane is flying smoothly, and all is well in the Operation IceBridge world. I like days like this. 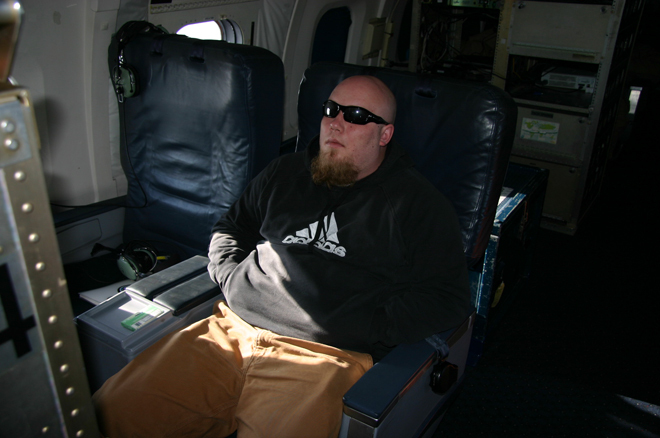 DC-8 data systems engineer Eric Buzay always looks productive. I’ve never seen this guy take a nap.Image is courtesy of John Sonntag. better the future of mankind. Definately want to share a few of my ideas in the near future as well. One in particular called earth moon suborbitals that could possibly work on the principle of MAGLEV. A idea to build floating city’s in a sense to counter climatic change. GODBLESS!!! Great pics, glad to see all is going so well and the weather is permitting so many flights. Is there a process to joining one of these trips as a visitor? Or is it just kind of a “friend of a friend” thing? whats with the blue ethernet cable? Jeeez, you would think you guys had a wireless router by now.